One of the advantages of living in a big city on a seacoast is that you don't have to hunt down green urban oases to get away from it all. Those patches do exist in Naples, to be sure —the Villa Comunale, the Floridiana, the Vineyard of San Martino , the grounds of the Botanical Gardens or the Museum of Capodimonte— but the quickest way is just to get on a boat, preferably a two-hour cruise up the Posillipo coast to the Isle of Nisida and back, but even a ferry boat along the same route over to the island of Ischia will do. Even a row boat —but get out there. The prominent city landmarks such as the San Martino Museum, the Castel Sant'Elmo, the Royal Palace, the Angevin Fortress, the Castel dell'Ovo (Egg Castle) are all immediately viewable from the harbor or shortly after rounding the breakwater and moving west. At the end of the seaside park called the Villa Comunale is the small harbor of Mergellina, mentioned in documents from the 13th-century and besung in a number of Neapolitan Songs. 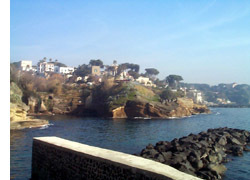 The actual meat of the excursion, however, is the long stretch of the Posillipo hill and coastline. very much until the overbuilding splurge after WWII. The Greeks first named the rocky, wooded height at the western end of the Bay of Naples Pausylipon, meaning "place where unhappiness ends". The area remained largely undeveloped until a road, via Posillipo, was built between 1812-24. That road starts at sea-level at the Mergellina harbor and moves up the coast, roughly parallel to the shore, but it actually angles up for over two miles to the cliffs some 200 meters above sea level at the cape overlooking the isle of Nisida. Additionally, the road angles in as it rises along the cliff; thus, by the time it wends its path to the cape, it has put a broad slope of land between itself and the sea. That is the slope, the broad swath of land, that you see as you glide west along the coast. Towards the end of the Posillipo hill, near the cape, some of the land is still farmland and under active cultivation. The immediate impression today along the whole stretch is of disastrous overbuilding. That impression corresponds 100% to the post-war reality of the area. Photos from the early 1900s (image, above, left) show a still largely wooded area with farmhouses scattered on the slope and villas along the coast. It is, however, rewarding to keep your eye on the string of villas that are at the waters edge (top photo). They are among the most exclusive bits of property in Naples and always have been; that is, near the cape, there are Roman ruins at water's edge. Higher up along the cliff face, just before the cape, you can even see the openings of the air-shafts that ventilated the Seiano Grotto that led to the residence of Vedius Pollio and even catch a glimpse of his amphitheater on a height. The houses at water's edge all have at least small piers or landings, and there are even a few small coves with breakwaters along the way. These small harbors are the nuclei for separate, named communities such as Marechiaro and Gaiola. Among the many residences, fabled and not so, along the coast, one that most attracts the eye is the Villa Rosebery (photo, right), a fifteen-acre estate about half-way up the Posillipo coast. The grounds are the official residence of the president of the Republic of Italy when he visits Naples. The estate rises over 100 feet from sea level to the back of the property. Villa Rosebery has a very mixed history. In 1801, an Austrian admiral in the fleet of Bourbon Naples, Josef von Thurn (one of the officers on the court-martial board that condemned Caracciolo to death in 1799—click here) bought the land and built on it. It was confiscated by the Bonaparte government of Murat in 1806 but returned to the admiral after the Restoration in 1815. The admiral sold the property, and in 1857 it came into the hands of Luigi di Borbone, the brother of the king of Naples. He called the property la Brasiliana in honor of his wife, the sister of the emperor of Brazil. The property was used sporadically in the 1930s as a residence by the Italian royal family when they were in Naples. After WWII, the Villa Rosebery was requisitioned briefly by the Allies, then used for a few years by the Italian Air Force Academy; finally, in 1957 it was declared one of the official presidential residences in Italy. 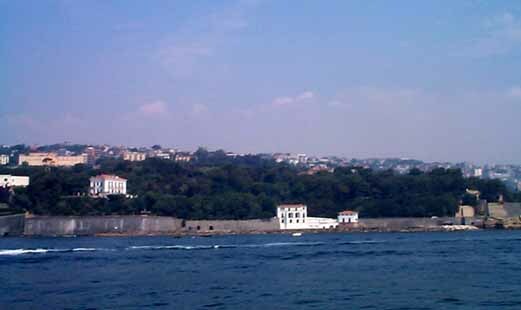 The heavily wooded estate is dotted with a few buildings such as the Grande Foresteria, (where the president stays) the Seaside Cottage (down at the harbor, photo, left) and a smaller guest house, still referred to—in spite of the anachronism—as the "Bourbon Palace" (photo, above, left).